The Sayaka Cultural Group, descendants from the Sayaka Inka village, brought the Condor Dance to unify with the Eagle in the North. They traveled from the highest lake in the world, (sacred Lake Titicaca in Puno,Peru) to come to The Gathering of Ancestors and share their sacred dance and music. This fulfilled a 500 year old prophecy handed down by their ancestors that the time would come when the Eagle and Condor would reunite. The Sayaka Cultural Group, descendants from the Sayaka Inka village, brought the Condor Dance to unify with the Eagle in the North. 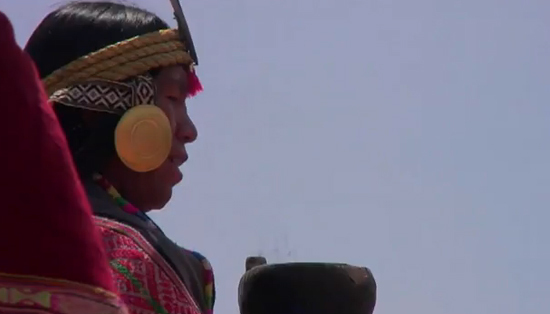 They traveled from the highest lake in the world, (sacred Lake Titicaca in Puno,Peru) to come to The Gathering of Ancestors and share their sacred dance and music. This fulfilled a 500 year old prophecy handed down by their ancestors that the time would come when the Eagle and Condor would reunite. The mission of these Condor wings, which are 5 generations old, was finally accomplished. This was the last time they will be used in the Condor dance. They would be retired to the River of The Condor upon returning to Peru. Everyone felt the emotion and how special the moment was. The wind was blowing the sand around all day. We were all covered up to try and keep the sand out of our eyes and mouth. Even though the conditions were harsh, it was a beautiful day.